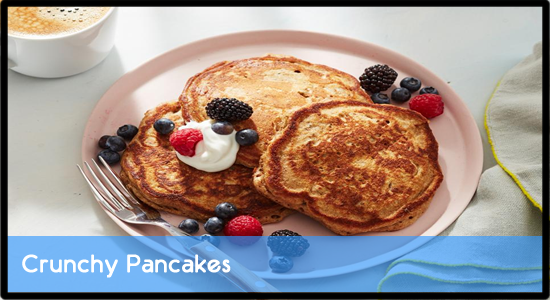 Make the batter by combining the pancake mix, milk, brown sugar, oil and eggs in a large bowl. Stir in the granola, flax seeds, chia seeds and sunflower seeds. Heat a nonstick skillet or griddle over medium heat and add a little butter. Drop in about 1/4 cup of the batter per pancake and fry on both sides until dark golden, about 2 1/2 minutes per side. Continue with the remaining batter, adding more butter if needed. Serve with fresh berries, Greek yogurt and mint.